The tournament was yesterday, the convention ended some time today. I spent most of today recovering from the efforts and trying to overcome the pain in my back and legs… I need a new hobby or a new body. I put way more effort into preparing for my demo game on Friday than I did for Lee’s Warhammer 40,000 tournament. I picked my army the morning of the tournament. I basically took the army I used in my last game of 40K, removed one HQ choice, replaced it with a dreadnought armed with twin-linked autocannons and then with the 200 plus points I had left over I thought, what costs 225 points, a landraider. This required me taking my special landraider transporting case, but that didn’t prove a problem until the end of the tournament. I was told to arrive at 9 AM, so I set my alarm for 6:30. I didn’t get up until well after 7 AM after a sleepless night. I couldn’t find my proposed army list for this year’s Astronomi-con tournament. It turned out to be in the Warhammer Fantasy Battle directory on my MacBook Pro… I also grabbed one lascannon model instead of the that squad’s autocannon model. Other than that I arrived and promptly had a half hour or more to sit around and wait for other people to arrive before we started game one around 10 AM. 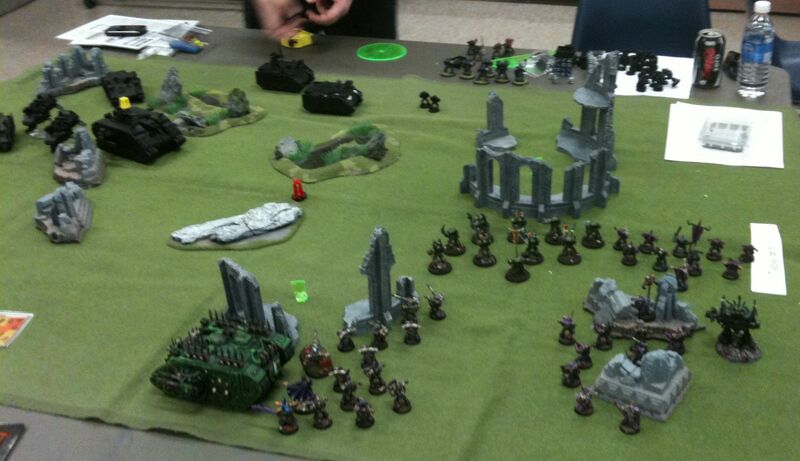 My game one opponent was Space Marines, in fact all of my opponents were loyalists space marines. 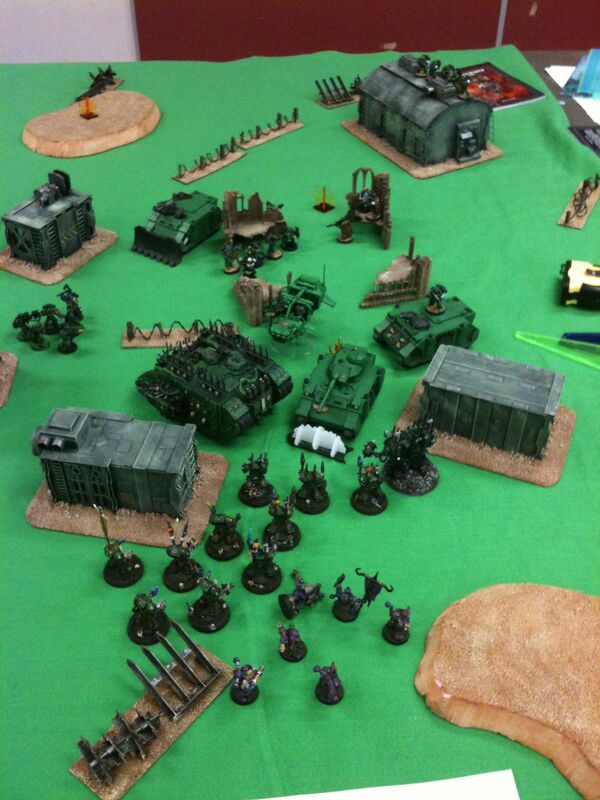 There were a lot of them, with only one Imperial Guard player, last year’s army of choice at Astronomi-con. There were actually three other Chaos Space Marine players. 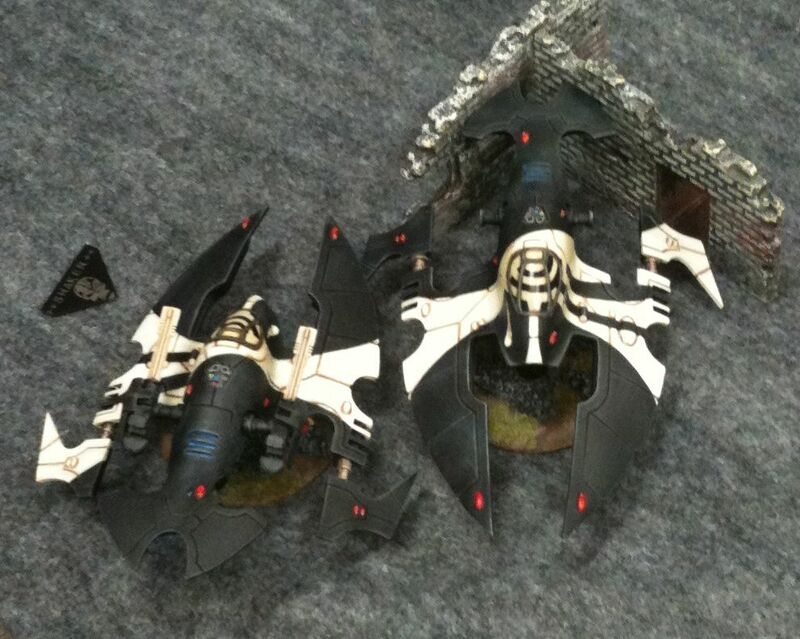 One was running an old army which had Kharne and I never got a picture of it. The other was running the hated, double deamon prince with lash, with doubt defilers and a bunch of obliterators Iron Warriors list. I’m not sure why you try to piss off and antagonize your opponent, but if you want to, that is the army list to do it. 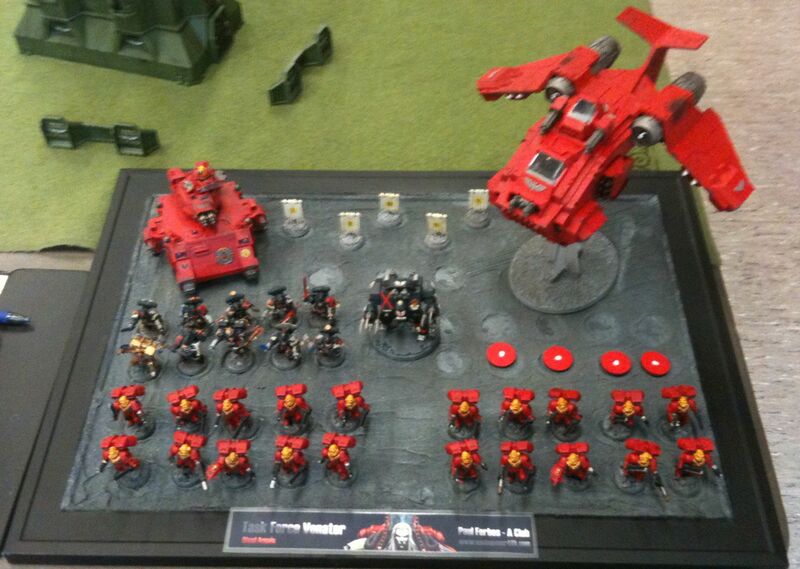 There were lots of Blood Angels with perhaps only one Space Wolf army. There were one or two Sister’s armies along with several Grey Knights. 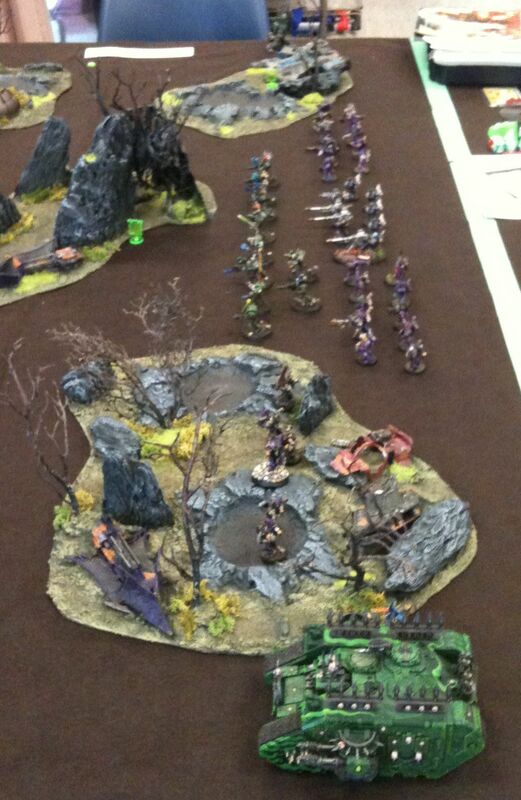 There were at least two ork players along with some Eldar and Dark Eldar. Hopefully Lee makes a list of which armies attended and where they placed available. I was using a far from optimal list, one with limited mobility, limited anti-tank capability and no dedicated assault squads. What I did have was a high model count and every autocannon in my miniature collection. That was kinda the theme. Missions were randomly assigned and kept secret from your opponent. This was a throwback to second edition. It also resulted in a lot of ties as in most of my games I accomplished my mission and so did my opponent. It also resulted in some surprised winners of overall and best general. Deployment was also randomly determined on a game by game basis, which worked less well in my opinion. It would have been just quicker to have all the games have a simple deployment or to have game one be Dawn of War, game two be another deployment, etc. etc. The tournament was 1700 points. 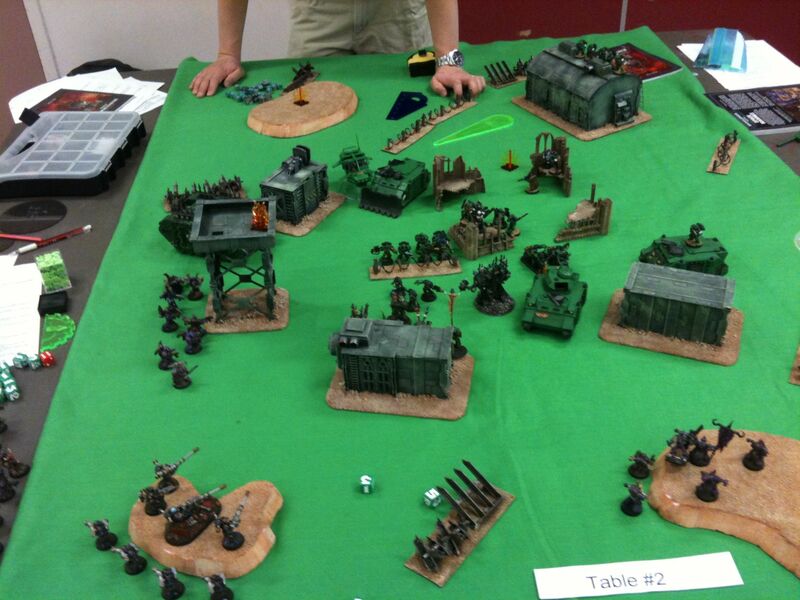 I think 1500 points is the optimal number for a game of Warhammer 40,000 played on a six by four foot table. As a result of it being 1700 points and neither me nor my opponent being the keenest of 40K players with every rule memorized, we struggled to get our game in. I think Lee would be wiser to switch to 1500 points or even smaller on a one day tournament. It would result in less special characters and increase the likelihood everyone would have their army painted. I think I ended up drawing on the secondary objective. The secondary objective was always four randomly placed objectives, one in each quarter of the board. With no dedicated transports I was hard pressed to get any that were far from where I deployed. I twice deployed in a single quarter, this is far from optimal when you have a Chaos Dreadnought in your army. The Beast Rabaan ended up killing at least 7 Nurgle Renegades. He may have killed a Grey Knight, but in the first game he was shutout and died to a multi-melta I believe. Multi-meltas are good, the only way a Chaos Space Marine army can get one is on a Dreadnought and unless they make dreadnoughts cheaper or give some other incentive to take them, they’ll sit on shelves like mine usually do. Apparently Imperial Armor stuff was OK in this tournament. That is a staple of Astronomi-con and that must be rubbing off on Vancouver tournament organizers. I didn’t know this in advance, not that it matters. I am broke and unemployed. What Forgeworld stuff I own is to improve the looks not the performance of my army. Not all Forgeworld stuff is cost effective point for point in game, but it always looks cool. I was doing alright after one game. I was never in the running to win. I just don’t care or try as hard as some people do. I play for fun and I use the models I’ve been collecting and painting since I was a teenager. Which is getting, longer, and longer, and longer ago. I drew Mark Spidal who is notorious for complaining about his luck and the unfavorable rules. He had a brand new one day old Grey Knight codex and apparently it was my option whether I let him use it or not. I did and he proxied some things. Hopefully he gets everything to his liking and painted in time for Astronomi-con. I set my army up in one big long line with my Landraider on one flank and the dreadnought on the other. Once again I won the role to deploy first and go first but this time, my opponent successfully stole the initiative. Mark moved around but didn’t kill much of anything. At the start of my turn, my dreadnought went crazy and killed three Nurgle Renegades with his guns. Turn two same thing, the Beast Rabaan goes crazy and blasts away more of my models. The rest of my army concentrated on killing his Grandmaster and the Grey Knight terminators he was with, as I reasoned they would cost the most and have the most spiffy rules. My actual mission was to keep my commander alive. To that end I put Lefty in my Landraider and he stayed there all game. Mission accomplished. Mark must have been feeling it as his Grandmaster despite having his terminator buddies shot out from around him, charged my ten man terminator squad. He threw in another Grey Knight squad in support. It was ultimately no contest. Why would you charge a terminator squad that outnumbers you? Mark and the Grey Knights got to go first and he had a bunch of power weapons and special rules, but in the end I ground him down. Mark then started retreating. He was down to about 8 Grey Knights at the end, plus of course two landraiders… Before his full fledge retreat and hide his Brother Captain and his squad decided it would be a good idea to advance on my Nurgle Renegade tactical squad sitting on the centermost objective. They were fresh off killing my Havocs in H2H and must have been feeling it. Never walk within 12 inches of a stationary tactical squad. 2 autocannon, 2 plasma gun, and 16 bolter shots later none of those Grey Knights were alive. In the end we tied. I kept my general alive and Mark’s remaining living Grey Knights allowed him to complete his mission. We both had a single secondary objective. Mark claimed after the game, he could have won by ramming my tactical squad with one landraider, but instead he shot at it. This all sounds wonderful in spirit, but I could have done a lot better with a couple of rhinos instead of a dreadnought which killed more of my models than it did his. Also his special rules and snazzy characters were killed by tactical squads and sub-optimal Nurgle terminators. My final opponent was another Vancouverite who I’ve played before at tournaments and local stores. He was using his Salamander Space Marines but he had changed his army list significantly in preparation of this year’s Astronomi-con. Turns out James has fallen in love with scouts, he had three squads of them. One on bikes, one in the fancy landspeeder, the final squad was more traditional with sniper rifles and a missile launcher. The assault scouts had sergeants with powerfists. The sniper scouts were led by a special character, Sergeant Telion. James had another special character, Chaplain Cassius. This game was hard fought. It started out with James scouting across the board with the bikes and the speeder scouts. He also dropped a dreadnought almost on top of my noise marines. I had gotten first turn, I think, but a lot of stuff was out of range or hidden from sight. The Beast Rabaan went crazy and killed some more Nurgle Renegades after I lamented how disadvantageous a Chaos dreadnought was especially in corner deployment. Maybe I should just stick him in reserve every game, or just not field a dreadnought which is the best plan for a Chaos player. Loyalist dreadnoughts are a lot better. They get drop pods. But that doesn’t matter when you deviate off the board. That was the end of that fellow. The Librarian warped across the board with the Sternguard to further threaten and surround the Noisemarines. They along with my sorcerer were shot at a lot then charged by two scout squads. The powerfists did their work and James must have been feeling it as he later charged my Nurgle renegade squad. Despite half of them not getting to fight in the first round due to being up a tower, I hung on and later routed both scout squads, proving the power of the humble tactical squad. The game was getting down to the nitty gritty and once again time was tight. I reorganized my troops to maximize fire on the scouts who were running away, plus the Sternguard and the Vanguard. I killed the scouts, all but one Sternguard eventually, but the landspeeder and Vanguard were luckier. 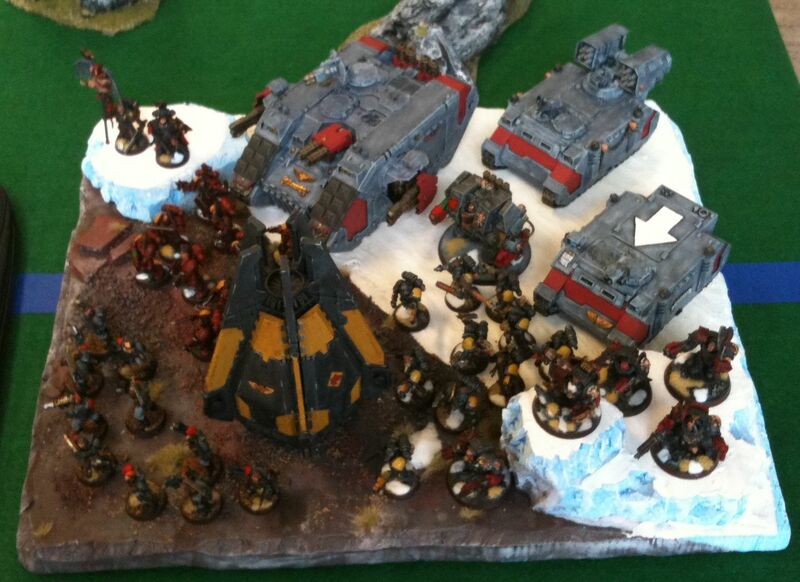 The Sternguard and Vanguard charged the dreadnought and the terminators. I liked my chances but special rules did me in. Before he died the Librarian casts some power making him able to hurt the dread in H2H. And the lucky saves for the Vanguard continued and they won the combat with the termies, who promptly failed their break test and the survivors were cut down like the cowards they were. 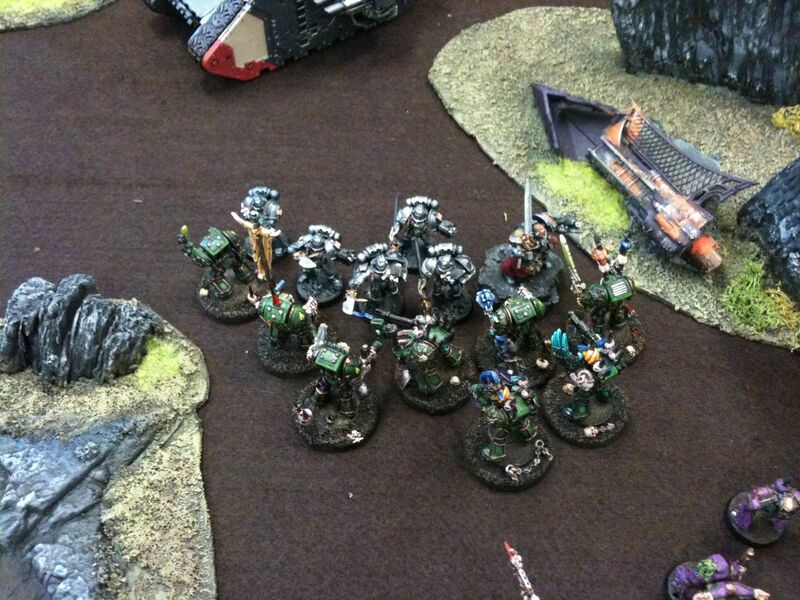 The last Sternguard went and hid between two tanks and the scout bikes rallied and also hid. 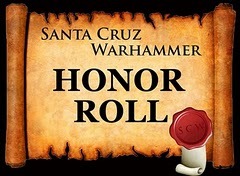 I had been redeploying my Havocs who finally got a bead on the Vanguard and along with the Nurgle Renegades I think I killed all the fancy pants loyalists. In the end James and I both accomplished our mission, but I lost the secondary one I think. Not enough mobility and scoring units. I have lots of other priorities in my life and spend most of my hobby time painting, or reading online, or blogging. Other attendees had fancier cameras than my iPhone so I’m sure more and better pictures will appear online eventually, I’ll try to link to pictures and accounts I come across. Trumpeters is primarily a historical gamers club, they tolerate sci-fi, fantasy, and RPG players, here is one of many historically accurate miniature games that was ran.